A Tour of Federal Hill, Bardstown, Ky. Recollections and images of Bardstown's most visited home. It happens frequently, I learned. And quite regularly. "They all complain about this place when they're working here, but they always come back to visit," explained Bucky Metcalf, who was my boss when I was a seasonal employee at My Old Kentucky Home State Park. 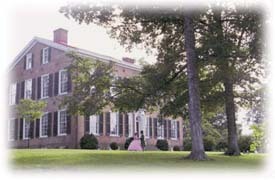 Bucky was referring to an invisible bond of sorts that forms between park workers and Federal Hill, the mansion home of the Rowan clan, the centerpiece of My Old Kentucky Home State Park in Bardstown, Ky. The park's main function is to commemorate (some say fabricate) the linkage between the Rowan family and their celebrated cousin, American composer Stephen Foster. The mansion represents Kentucky on the back of the Kentucky quarter. Running a weedeater down the park's golf course fence along Hwy 49 in 95-degree heat wasn't my idea of a good, memorable time, but universally, everyone I worked with had a deep sense of loyalty and respect to what Federal Hill was then and is today. Federal Hill -- known to us who worked there respectfully as simply"The Home" -- commanded our respect like the grand old matriarch of the clan Kentucky. One of my favorite chores as a park employee was preparing the home on weekends for visitors, vacuuming the carpets in preparation for the day's tourists. The early morning sun would be filtering through the tree tops into Judge Rowan's bedroom; the home was silent, save for the vacuum cleaner and my own footsteps. Sometimes, I just stood and looked around, soaking in the ambiance and wondering what the place was really like when Judge John Rowan was there. It's a safe bet that nearly everyone who has worked at the park has at least one print or photo of Federal Hill on a wall in their home; we have several on display in my own home and several others rolled up waiting for frames. In the years since my tenure at the park, I've been a casual collector of postcards featuring Federal Hill and Bardstown. I've posted a few images from my collection here. The home has been well photographed over the years. I''l be adding more in the future. Take your time and enjoy! Click the images to enlarge them. Most of them are about 800 pixels wide -- enough to fill your screen. Please be patient, I think they're worth the wait.